I just tried out Purple Frog insect shielders. These are really great and easy to use. You get a sheet with 12 of them on it. Simple pop one out, it has an adhesive back. Press on it to release the the aromatherapy scents and place it anywhere you need it. I got two different ones Lemongrass & Citronella which is really great for bugs and insects. I use these all the time outdoors. You can stick the pads anywhere, so I will put one on the lawn chair, in the tent, on my backpack, just to keep the bugs away. They smell great too unlike all those toxic bug sprays. These are 100% natural and do just as good a job as the sprays. I also got peppermint and eucalyptus and it smells really good. It great for in the car, the kids locker, anywhere you need some great smelling aromatherapy. I use these all the time and they work great. 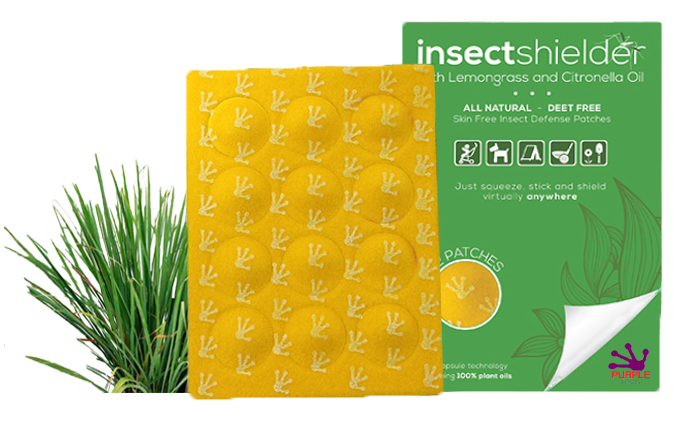 Protect against biting insects such as mosquitoes, black flies, gnats, tics, fleas and even bed bugs. Simply Squeeze the 80MG microcapsule inside each patch to release the natural essential oil formula and stick virtually anywhere for instant, long lasting aromatheraputic relief! Safe and easy to use alternative to messy chemical sprays and lotions at home, outdoors, when travelling and even while you sleep. Check out the Purple Frog Website and also you can find them on Amazon!